The annual meeting of the Association of Performing Arts Presenters kicked off with a wide ranging discussion of the impact of technology on the arts. Led by Jean Cook from the Future of Music Coalition, a panel of artists and representatives of arts service organizations touched on many different ways that technology is changing the lives of artists, presenters, and audiences. Not surprisingly, much of the discussion focused on the new level of uncertainty that digital technologies bring to artists’ always unpredictable livelihoods, while other parts of the conversation covered new ways that artists can use technology to expand their creative options. The Best of APAP 2012: FMC and Free Things! Friday, Jan 6: 9:00 AM - 12:00 PM JazzConnect: Building Jazz Culture – Local to Global Hilton, Sutton South How do you build and support a thriving cultural community? What are the possibilities using jazz to do this? Where are the obstacles preventing effective growth and community building? What are the successes? How can jazz improve branding and advocacy? What are infrastructure opportunities from other industries to learn from? Join in the opening session of the JazzConnect track developed to explore these questions over seven sessions with dynamic and inspiring leaders, speakers, and visionaries. 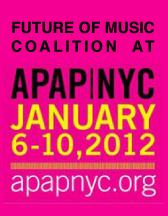 Future of Music Coalition is once again curating a number of conversations at the annual Association of Performing Arts Presenters conference in New York City, January 8-12, 2010. Join us for sessions on the issues at the intersection of arts, technology and law; media, copyright and technology; and health insurance for creators. FMC is partnering with the Association of Performing Arts Presenters and FTM Arts Law to present a special copyright/royalties track at the 2009 APAP Conference in NYC. This year’s event takes place at the Sheraton and Hilton Hotels in the Big Apple from January 9-13. The three sessions FMC is participating in will look at the basics of copyright, contracts and royalties (Sunday, Jan. 11), a best practices discussion/support group for folks who have encountered royalties and copyright issues in their presenting/producing work (Monday, Jan. 12), and a policy update on where the copyright landscape is headed (Friday, Jan. 9).